Directed by Oscar® winner Steven Soderbergh, this dynamic action-thriller introduces mixed martial arts (MMA) superstar Gina Carano as Mallory Kane, a black-ops agent for a government security contractor. After freeing a Chinese journalist held hostage, Mallory is double-crossed and left for dead – by someone in her own agency. Suddenly the target of assassins who know her every move, Mallory unleashes the fury of her fighting skills to uncover the truth and turn the tables on her ruthless adversary. Featuring Carano performing her own high-adrenaline stunts and an all-star cast including Michael Fassbender, Ewan McGregor, Bill Paxton, Channing Tatum, Antonio Banderas and Michael Douglas, Haywire is explosive movie entertainment. $8.425 million on 2439 screens. As I mentioned when I reviewed We Bought a Zoo, sometimes the name above the title catches you by surprise. I didn’t expect a potentially banal family flick like Zoo to come from Cameron Crowe, and when I saw the trailers for 2012’s action extravaganza Haywire, I sure didn’t think I’d see Steven Soderbergh attached as director. But Soderbergh indeed took the reins on Haywire, a fact that made the movie more intriguing than the average action thriller – at least on the surface. After a quick, violent confrontation leaves secret operative Aaron (Channing Tatum) wounded at the hands of his former partner Mallory Kane (Gina Carano), she goes on the road with the aid of innocent bystander Scott (Michael Angarano). From there we flash back to see what led Mallory to this spot. She gets an assignment as the leader of a team tasked with the extraction of Jiang (Anthony Brandon Wong), a kidnapped Chinese scientist. Though she plans to leave the “company”, her boss/former lover Kenneth (Ewan McGregor) convinces to go on another allegedly easy job as “eye candy” with MI6 agent Paul (Michael Fassbender). This goes down a bad path for Mallory and we follow her attempts to stay alive as she goes on the run. Soderbergh usually works with scads of big-name actors. For instance, look at his prior flick, 2011’s Contagion, as it came with a slew of well-known performers. The same trend continues here. In addition to Tatum, Fassbender and McGregor, Haywire features Michael Douglas, Antonio Banderas and Bill Paxton. No, that’s not the most star-packed cast you’ll find in Soderbergh’s history – it’s virtually impossible to top the Ocean’s flicks – but it’s still a lot more wattage than we usually find in movies like this. The big change of pace comes from the lead. Best known for her work as a Mixed Martial Artist, Carano came to Haywire with next to no acting experience. Placing an inexperienced actor at the heart of a movie means a risk, and it’s one that doesn’t pay off for Soderbergh. Not that I think Carano offers a bad performance, but she does drag down the movie to a moderate degree. She’s fine during the action scenes and gives the character the necessary physical attributes, but she offers little to no range. Whenever the movie asks her to play anything other than a badass, she stays in the same mode. She’s a badass when she’s supposed to be tough, she’s a badass when she’s supposed to be scared, she’s a badass when she’s supposed to be alluring – it’s all badass, all the time. The others do their best to compensate, but the story lets them down as well. Haywire does virtually nothing to reinvent the spy/action genre, so it comes with the usual double-crosses and whatnot. It builds precious little tension and actually feels rather aimless much of the time. The characters seem predictable at best and dull at worst; we find no interesting personalities along the way, so combined with the lackluster narrative, there’s not much on which to hang our hats. Stylistically, Soderbergh attempts to spice up the presentation. Much of the time Haywire feels like a more action-oriented Ocean’s movie; with its slick visuals and jazzy score, its style fits that series. It also throws in a little Out of Sight vibe along the way. Unfortunately, those factors just make me want to watch an Ocean’s flick or Out of Sight instead, as all four of those efforts prove to be significantly more entertaining than Haywire. Soderbergh’s inability to stage a quality action sequence doesn’t help. Haywire features a surprising dearth of action set pieces, and when they do appear, they’re pretty lackluster. Some good fights could’ve enlivened the film, but instead, these scenes just reinforce the general sense of dullness. Maybe Soderbergh’s lost his mojo, as he produces more misses than hits these days. Contagion was muddled and slow, and Haywire lacks the requisite punch and pizzazz to make it a good action thriller. While Soderbergh continues to make professional films, they fail to excel in any way, and that continues with Haywire. Haywire appears in an aspect ratio of approximately 2.40:1 on this single-sided, double-layered DVD; the image has been enhanced for 16X9 televisions. Haywire delivered a pretty good SD-DVD presentation. Sharpness was good for the format. Some inevitable softness materialized at times, but that related to the limitations of SD-DVD more than anything else. Overall definition seemed satisfactory. I saw no signs of jagged edges or shimmering, and edge enhancement was absent. Source flaws failed to mar the presentation; it always was clean and fresh. Colors looked fine. The film opted for a stylized palette, with an emphasis on blues and yellows. Within those parameters, the hues were well-reproduced. Blacks came across as dark and firm, while shadows were pretty good. Some interiors seemed a little murky, but those shots weren’t too off-putting. Overall, this was a pleasing presentation. As for the Dolby Digital 5.1 soundtrack of Haywire, it was good but not exceptional for an action movie. Some of that stems from the movie’s emphasis on music over action theatrics. Occasional fireworks emerged – such as during chases or fights – and these opened up the room in a satisfying way. They didn’t crop up with great frequency, though, so don’t expect a ton of involving material. The track created a reasonable soundscape but nothing scintillating. The quality of the audio was fine. Music showed nice range and definition, as the movie’s score worked well. Effects appeared acceptably clear and natural. Speech came across as distinctive and natural. In the end, this turned into a “B” soundtrack. Not many extras show up here. A featurette called Gina Carano in Training goes for 16 minutes, one second and provides notes from World Extreme Fighting founder/owner Jamie Levine, director Steven Soderbergh, special ops technical advisor Aaron Cohen, fight choreographer JJ Perry, and actors Gina Carano, Channing Tatum, Ewan McGregor and Michael Fassbender. The program looks at Carano’s fighting career, how she came onto Haywire, aspects of Carano’s training, and shooting fight scenes. “Training” offers a smattering of decent notes, but it seems to exist mostly to tell us how tough and talented Carano is, so it doesn’t deliver much meat. The Men of Haywire lasts five minutes, 20 seconds and features Fassbender, McGregor, Tatum, and actor Antonio Banderas. “Men” gives us a few cast/character notes as well as some thoughts about Soderbergh’s work on the set. It’s a fairly superficial program. 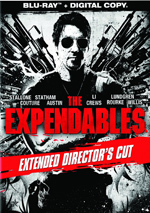 The disc opens with ads for The Expendables 2, The Hunger Games, Warrior and Set Up. In addition, these appear under Also from Lionsgate. No trailer for Haywire pops up here. 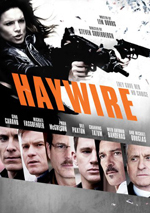 With Steven Soderbergh behind the camera, I hoped Haywire would deliver an interesting twist on the action genre. Instead, we get something that emphasizes style over substance; it has occasional fun moments but usually focuses too much on visuals and not enough on characters or story. The DVD offers pretty good picture and audio but lacks substantial supplements. Leave this disappointing effort on the shelf.